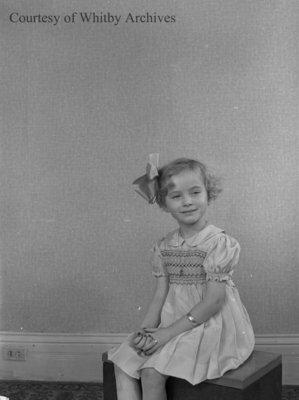 A black and white large format negative of little girl sitting on a box with her hands in her lap. The negative envelope refers to the child's last name as Murdock. Murdock Child, November 29, 1947, Marjorie Ruddy. Whitby Archives A2013_040_494.